Baseball Practice Drills are based on the theory that repetitive actions are required to teach and fine tune skills, which are required to properly play the game of baseball at a high level. I can not and will not argue the success of the theory, as it’s a proven fact…it Works. However, even the most avid player, can at times become a little bored with the same routine over and over with very little variance, especially later in the year. We’re going to look at a few Unique Baseball Practice Drills, pertaining to setting up defensive plays and executing scoring plays, which can be utilized to put a little hmmmf and excitement back into the practice, as well as teach skills which are often overlooked in the amateur ranks. Every now and then there will be an uprising in professional baseball to do away with the actual physical actions of issuing an intentional walk, substituting an automatic “Take Your Base“ when the Coach informs the umpire of his intentions. Time and time again the Rules Committee has rejected this proposed change and with good reason. Anytime the ball is put into play, which is the throwing of four balls to the catcher, there’s always a chance something could go wrong. Although the intentional walk is not usually addressed at the amateur level, it should be and we’re going to exam how it’s properly performed. 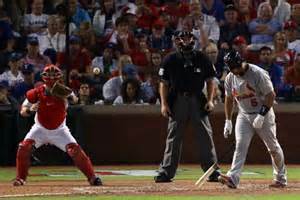 I’ve never seen a Lead Off Batter, in any inning, at any level, issued an intentional walk, as there’s always a reason you are issuing an intentional walk, and it’s usually a tactical move to change a Bad Situation for the defense, into an advantage or at least to offer a feasible way out of the problem. (1.) With no outs, a hitter has just hit a double, represents the winning run, and the next scheduled hitter is the number 4 spot and he’s 3 for 3 today, hitting the ball hard each time at bat. (a.) A normal base hit by this hitter will score the runner from second and loses the game for you, so therefore you eliminate the chance of this occurring by issuing an intentional walk to the hitter putting him on first base. (b.) You have set up a double play situation, and / or a Force Out opportunity at any base. You’re still in big time trouble, but you’ve set up and improved an opportunity for the defense to work out of the mess. (2.) Runners on Second and Third, 2 out. You issue an Intentional Walk to load the bases, which will create a Force Out situation at Any base, including Home Plate. Why? A ground ball up the middle, which the second baseman dives for and knocks down, allows him to flip to the shortstop covering second base for an inning ending force out. 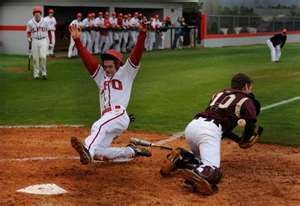 Had the bases not be full, the ground ball would have resulted in a hit and a run scored. (a.) Your first job is to Hold any Runners Close to their base as there‘s no reason they should be allowed to venture off. If there’s a runner on second base representing the run you’re attempting to stop scoring, and because you allowed the runner to obtain a walking lead off, because you ignored him, and he steals third base … Well, don’t let it happen. (b.) Once you decide to throw to the plate, immediately pick up the target your catcher is showing and throw a normal throw, as fastball as if you were warming up, to that target. 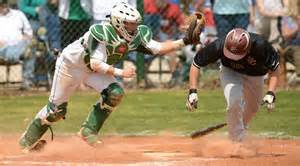 Do not lob the ball, you lose control, or zip it in, don’t make it difficult for your catcher, as both throws could most likely result in catastrophe. (c.) Perform this exact routine on all four pitches, because a pitcher who doesn’t check the runner on the fourth throw, because it’s ball four, runs the risk of the runner stealing third base. In fact, a good base runner would be more inclined to run on ball 4 than any other throw, because of the confusion created by the hitter walking, which adds to the action. (1.) Your first and primary job is to offer the pitcher a good target to throw at. (a.) While positioned in the “catcher’s box,“ stand, extend your hand, or mitt depending on a left or right handed hitter, straight out at shoulder level. Don’t be lazy, hold that arm straight out and offer a steady target, as you’d be surprised how many pitchers can’t throw accurately unless they see a target. (b.) As the pitcher releases the baseball, move your entire body the direction of the target you’ve been holding, stopping with knees bent, shoulders square and feet solidly planted. You want to be in fielding and throwing position should the throw be errant or the runner takes off. 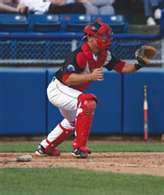 You must be somewhat careful of your timing when you leave the catcher’s box, in other words don‘t think you can set up outside of the catchers box in order to make it easy on yourself or your pitcher. (c.) This may sound silly, but be sure you catch the baseball, as sometimes when action is slow the eyes will dart about feverishly and that’s when mishaps occur. Upon catching the ball, immediately locate the runner, lead runner if more than 1 is on, and be prepared to throw him out should he attempt to steal. Another drill which should be practiced in conjunction with the “intentional walk drill” is throwing behind the runner. Sometimes, especially a runner on first base if there‘s a runner on ahead of him, will become a little lazy returning to the base after the pitch during an intentional walk. Don’t hesitate to throw down there if you think you have a chance of throwing him out. That’s a Real Game Changer. The Suicide Squeeze play is one of the most exciting plays in baseball, and as the name indicates … the most dangerous. If it succeeds, you’ve scored the run, which possibly wins the game. If it fails, you’re a goat by running yourself out of a possible run without allowing the batter the opportunity to drive the run in. The chances of a suicide squeeze bunt being successful is, at best, questionable. Therefore, the play should not be called lightly and there should be specific situations where a suicide bunt should be considered. (1.) You’re involved in a Pitchers’ duel, where runs have historically been difficult to score on the opposing pitcher. You have a runner on third, 1 out and the bottom of your line up is scheduled to hit. Feeling the opposing pitcher will dominate your hitters, probably by strike out, and you need to try something radical to get a run home. (2.) Again, a Pitchers’ duel, runner on third and an excellent bunter at the plate. You take the chance of implementing the suicide squeeze based on your knowledge that the hitter has a very good chance of laying a bunt down, or at least making contact, which a foul ball saves the runner because the ball is immediately declared dead. As the runner on third base you have a lot of responsibilities to insure you score on the play. (a.) Always take your lead off in foul territory, and although this has nothing specific to do with the squeeze play, it’s a base running Rule that should never be broken. (1.) Your lead off will depend on several key factors…. (a.) Is the pitcher using the stretch or a full windup? If he’s using the full windup you can take off for home the instant he begins the windup motion, because if he stops it’s a balk and you’re awarded Home Plate. (b.) If he’s pitching from the stretch, you must be sure he commits to go home before you take off for the plate. If you start your run to Home too soon, the pitcher will simply step off the rubber and chances are 99% you’ll run into an out. (c.) Where is the third baseman playing? If he’s playing off the base, even with the pitcher using the stretch position, you can extend your lead, however, if it happens to be in the late innings and he’s playing close to the line in order to prevent an extra base hit, you’ll have to shorten your initial lead. (d.) Once you commit to running home, run as fast as you can, never hesitate as you are committed to run home and there’s no turning back… don’t concerned about anything else. Baseball Practice Drills - Slide Home - Feet First ! A successfully executed squeeze play will not require you to slide into home plate, however, there’s always the chance batter may bunt the ball out in front of the plate, within distance of the catcher fielding it and diving back to the plate in an attempt to tag you out, or too hard to the charging pitcher, who would flip the ball to the waiting catcher. These two scenarios could result in a play at the plate and you want to be sliding in case there is. Therefore, it’s important you know where the baseball is, at least until the point you know if you should slide or not. Unfortunately, there’s always the chance, the hitter will fail to bunt the ball, but the surprise of you attempting to score may still be enough to allow the play to succeed, and you’ll want to be sliding feet first because …. (b.) You do not want to slide arms extended first, because the possibly of severe injury to your hands, fingers or wrist should they collide with the catcher’s legs and hard plastic shin guards, which will not give, is far too great to risk. Better Out, than Injured. (1.) The absolute number one issue on the bunter’s mind is to make contact with the ball no matter what it takes ! Doesn’t matter if the pitch is a strike or ball, if you bunt it fair or foul, if you miss the ball the runner is all but out 99% of the time. I have seen plays when a pitcher has seen the runner attempting to steal, most likely because either the runner left a split second too soon, pitcher was lucky, or had excellent peripheral vision, allowing him to throw a “miniature pitch out” where the batter literally threw their bat at pitch in order to make contact. There was no attempt to properly lay down a bunt … only to protect the runner from running into a sure out. (2.) Disguise your intention to bunt till the last second, but once the pitcher is well into his wind-up, or comes home from the stretch, immediately get into good bunting position. Everyone is committed at this point and there’s no turning back. (a.) An excellent rule of thumb for timing your move into a bunting position is when the pitcher reaches his release point. (3.) Square around, knees slightly bent, slide your hand up the barrel of the bat stopping at @ the trademark, making sure your fingers are Not wrapped around the bat, but rather holding it gently from behind. (4.) Be sure your bat is in Fair Territory when making contact. If your bat is not in fair territory you run the risk, @ 80%, that the ball will be bunted foul. Although bunting foul saves the runner from being put out, you have failed to score the run. (5.) 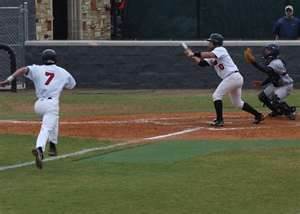 As soon as you make contact with ball, begin your run to first base. There’s no need to hesitate to see where the ball went, it’s either a good bunt and the runner will easily score, or there will be a play at the plate and you don’t want to be there if it happens, because it’ll quickly get crowded and you’d run the risk of being called for interference. The safety squeeze has all the elements of the suicide squeeze per se, except it reduces the chance of failure and running into an out by 70%. 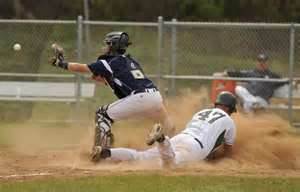 On this play, the runner on third does not commit to run home until he sees the batter has bunted the ball. At first glance this may appear to be an automatic play, but not so. The runner must be skilled with quick feet and quick decision making ability. (a.) 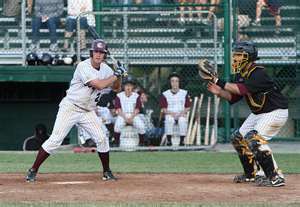 The runner must get an excellent< secondary lead in order to be able to score when the ball’s bunted. However, if he gets too far off third base and the hitter fails to bunt the ball, he’s in “No Man’s Land” and subject to being thrown out by the catcher while trying to get back to third base. (b.) If he doesn’t get a good secondary lead, even if the ball is bunted there’s a risk of being thrown out at the plate. The inability to get a good secondary lead can also result in the runner hesitating, which can not only prevent him from scoring, but could get him thrown out trying to score or return to third too late. (c.) The runner must be able to make and act upon a split second decision. For instance, the ball is bunted, but it may be straight back to the pitcher, four to six feet in front of the plate, bunted hard towards the first or third baseman, all of these situations require split second reaction. Working on these 3 unique Baseball Practice Drills will change up the hum drum of a normal routine, while teaching skills which are required to achieve a much higher level of play.